Many people, especially fair-skinned people in sunny climates (like North Carolina), will develop areas of the face as they age where superficial veins and capillaries in the skin become enlarged and highly visible. Because of their typically irregular and spidery appearance, these superficial cutaneous vessels are commonly referred to as ‘spider veins’. The medical term for this phenomenon is ‘telangiectasia’, which is essentially Greek for ‘the stretching out of the very end of a blood vessel’. And that’s essentially what ‘spider veins’ are. They occur most frequently in the central face, particularly on the anterior cheeks and at the base of the nose. Some people develop very prominent spider veins on the dorsum and tip of the nose, where they are difficult to conceal. Rosacea is a condition of the facial skin where the central face (nose, cheeks, chin, and central forehead) gradually turns red and develops numerous fine telangiectasias. These areas easily become flushed, particularly after physical exertion, eating spicy food, or having a glass of wine. Rosacea has traditionally been treated with topical agents and oral antibiotics, however most patients experience improvement only when the medications are in use, with return of rosacea once the treatment is stopped. For many patients, rosacea is fairly resistant to topical and oral medications. The cause of spider veins and rosacea is not completely understood, and appears to be multi-factorial. Contributing factors may be a genetic predisposition, the chronic use of topical steroid agents, and solar damage to the facial skin that gradually builds up over many years. Rosacea occurs most commonly in warm climates where people get a great deal of year-round sun exposure. These conditions can perhaps be prevented (in part) by the avoidance of excessive exposure to ultraviolet radiation (the sun, that tanning bed), the avoidance of chronic topical steroid use, and by the daily use of a high-SPF facial sunblock. In some cases, telangiectasias are associated with a systemic autoimmune disorder, such as scleroderma. Once a person develops facial telangiectasias and/or rosacea, these conditions in general do not spontaneously disappear. So how do I get rid of rosacea, or my facial spider veins, or both? The ideal treatment for ‘spider veins’ and rosacea should be easily administered, safe for the patient, reliably effective, should not require an excessive number of treatments, should be non-invasive, and should not have a prolonged recovery period. Here’s the good news: such a vein treatment does exist. 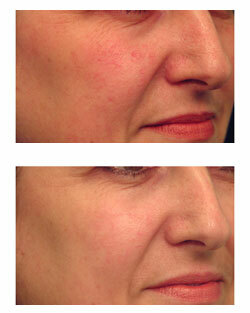 The V-Beam Laser, a pulsed-dye laser developed specifically for the treatment of cutaneous vascular disorders, can completely eliminate most facial ‘spider veins’, usually in two to three treatments (large areas of long-standing spider veins may require more treatments), and can reverse the cutaneous manifestations of rosacea as well. In addition, the laser energy pulse delivered by the V-beam has been modified to limit the development of post-treatment bruising (purpura), a problem associated with older pulsed-dye lasers. The V-Beam laser uses light energy of a wavelength that is specifically absorbed by structures which are reddish or purple in color, i.e. capillaries and small arteries and veins. The V-beam incorporates a Dynamic Cooling Device which sprays the skin with a cooling agent immediately before every laser pulse. This advanced technology both protects the skin from thermal energy and reduces the discomfort previously associated with pulsed-dye laser treatment. The laser pulses are generally described by patients as feeling like ‘a rubber band snapping against the skin’. No anesthesia (topical or otherwise) is required. 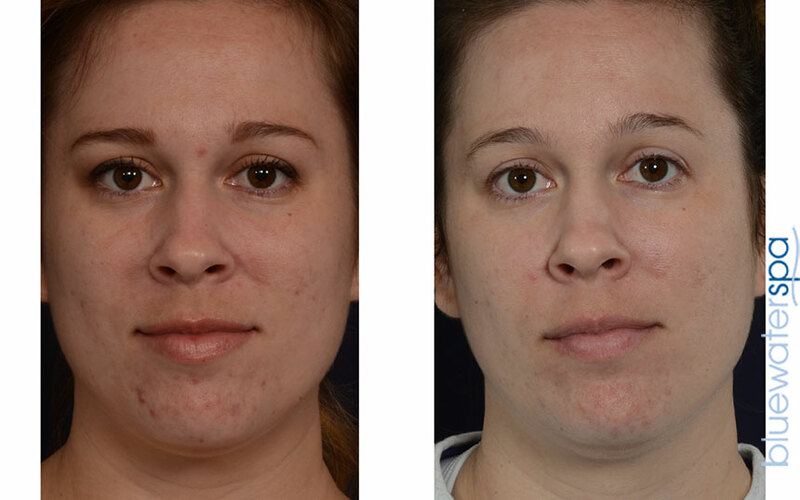 While pulsed-dye laser technology has been available for decades, pulsed-dye laser treatment of rosacea and facial telangiectasia was not frequently performed as the laser energy tended to explode superficial blood vessels, producing facial bruising that may persist for several weeks. The V-Beam Laser modulates both the peak energy and the duration of the laser pulse in order to coagulate rather than explode dermal blood vessels, which allows treatments to be performed that produce little or no bruising. This advanced technology makes it possible to achieve significant clearance and even complete elimination of facial redness and spider veins with no ‘downtime’. 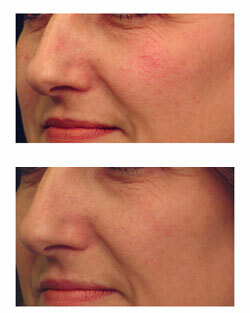 Is the V-beam Laser a ‘cure’ for rosacea? That really depends upon how one defines ‘cure’. If by this one means “can you eliminate the facial redness, flushing and spider veins that I walk into your office with?”, then the answer is YES – we are able to completely eliminate these findings for many of our patients with a series of V-beam laser treatments. However, any individual who has experienced resolution or significant improvement in rosacea following V-beam laser treatment is at risk for recurrence of facial redness and flushing if they do not take steps to avoid the primary risk factor: ultraviolet light (sunlight) exposure. We strongly recommend that our patients ‘protect their investment’ by using a high-quality, chemical-free sunblock on a daily basis, rain or shine, summer or winter. Hats are also highly recommended in the summer months. Appropriate protection from damaging UV rays can prevent the recurrence of the facial redness and flushing associated with rosacea for most patients. For more information about vein treatment or if you would like to schedule a complimentary vein treatment consultation, please contact the Raleigh, North Carolina office of Dr. Michael Law Today!